When bone spurs become problematic and cause nerve impingement, potential treatments include anti-inflammatories, muscle relaxers and pain medications. Physical therapy and cortisone injections might be prescribed too. These treatment options might provide some relief, but don’t usually solve the cause of the problem. If a patient has been suffering from a bone spur for more than three months, the condition has restricted normal movement, caused other serious difficulties and conservative treatment has failed to resolve the problem, then surgical procedures are recommended for long-term relief. A foraminotomy is a decompression surgery performed in order to increases the space of the foramen and hollow out the passageway where the nerve roots exit the spinal canal. The procedure involves the removal of bone or tissue that obstructs the neuroforamen and compresses the nerve roots leading to inflammation and radiating pain. The removal of part of the lamina is often necessary for the surgeon to gain access to the affected nerve roots in the neuroforamen. For this reason the foraminotomy is often performed in conjunction with a laminectomy or laminotomy. A laminotomy is a common decompression surgery for spinal stenosis that resembles the laminectomy in its goals and technique. The difference between the laminectomy and the laminotomy is that the laminotomy involves making an opening in the lamina to gain access to the disc, where the laminectomy necessitates the removal of the lamina section of the vertebrae. In either case the goal is similar, to relieve pressure on the affected area and allow the nerve roots room to heal. Both procedures are often utilized in order to give the surgeon the proper space to perform the foraminotomy. A laminectomy is a surgical procedure performed to treat spinal stenosis. The surgery is designed to relieve pressure (decompress) on the spinal cord or spinal nerve roots through the widening of the spinal canal. The procedure is carried out by removing or trimming part of the lamina (roof) of the vertebrae in the compressed area. The removal of part of the lamina creates an opening for the compressed nerves, relieving pressure on the nerve roots and reducing inflammation. The partial removal of the lamina may also allow the surgeon to remove any bone spurs or damaged tissue causing pain and inflammation in the patient. A resection of osteophytes is a procedure that removes bone spurs or enlarged ligaments that are compressing the nerves. 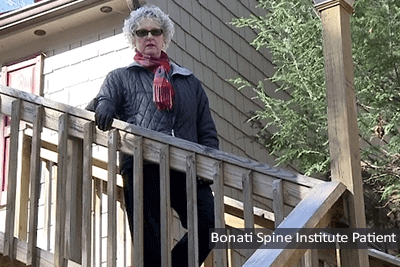 The Bonati Spine Institute encourages patients with bone spurs to contact us to request a no-obligation MRI review or discuss your conditions with our medical professionals. Find out why The Bonati Spine Procedures are considered to be among the world’s best solutions when it comes to advanced spine surgery. Your pain from bone spurs can become a thing of the past.